Launched in 2010, HDBaseT is 10Gb/s technology that transmits and receives multimedia signals with no compression and zero delay. It also routes power, control and audio, all though a single, low cost cable. HDBaseT is a true breakthrough technology. …through low-cost CAT-5 and CAT-6 cable up-to 100m in length. HDBaseT-Lite solution enables the same single-cable transmission of uncompressed HD video, audio, power and controls through a single LAN cable. However, transmissions distances are shorter – around 70m. How does HDBaseT compare to SDI? HDBaseT can transmit data over similar distances but has the advantage of supporting 4K video with embedded surround sound audio in a single cable. Plus, it sends data, control signals and power - something that SDI does not support. How does HDBaseT compare to HDMI? HDBaseT can transmit data over much greater distances than HDMI yet still supports the same 4K video formats. 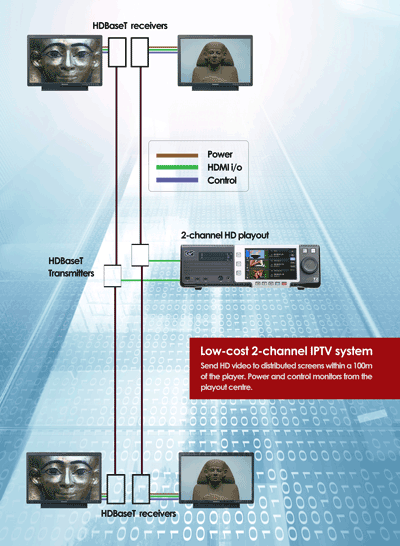 Crucially, HDBAseT adds data, control signals and power transmission.